Our 2008 T5 Dayvan for sale with remote control Eberspacher Airtronic night heater making this a van for all year round camping. This van has some service history and will have a full service when sold, the gearbox has recently been reconditioned and a new camshaft along with belt water pump etc has just been fitted, the van drives perfectly. Inside this van has been treated to our premium carpet lining, this consists of new hardwood ply lining, insulation and carpet lining, in this particular case the popular two tone carpet lining. The floor has also been treated to a new hardwood ply board with gel backed flooring carpet fitted in black. There is a new deeper Kombi sidestep with integral courtesy light fitted and a full width rear threshold. Blackout thermal blinds give a quality touch to both side windows. A full width 3 seat Techbed rock and roll bed has been installed and upholstered with the front 1+2 cab seats upholstered to match. There bed boards are made from lightweight furniture ply with access doors both front and rear and matches the table and low level storage cabinet along the offside which is topped with Samsung Staron solid surface worktop. 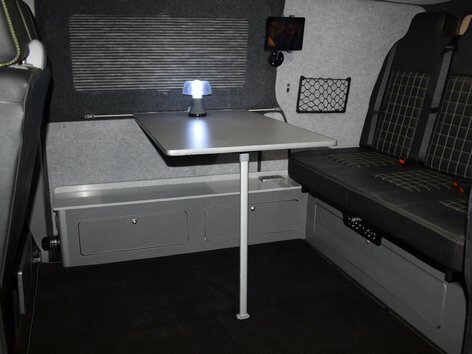 There is an intelligent 140 Amp split charge relay armoured to 60 Amps and a 100Ah leisure battery under the driver seat, this powers the 4 LED down-lights and 2 x Auxiliary sockets in the bed kick board and cabinet. An Eberspacher Airtronic D2 night5 heater along with Easy Start Remote+ control unit and timer has also been fitted making all year round camping a reality! In the cab there is an Alpine touch screen Satnav DVD player fitted into the piano black dash centre and leather bound flat bottom steering wheel. Externally the van is finished in Volkswagens' Indian Blue. 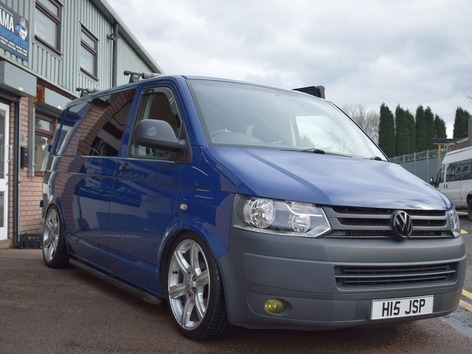 It has been treated to a GP front end including mirrors and genuine VW T6 rear lights to give it a more up to date look. We have fitted a set of V-Maxx Xxtreme Coil-overs and it rolls on 20" Range Rover wheels. We have fitted front fog lights. There is a genuine Westfalia Tow Bar with correct electrics. Team Heko wind deflector adorn the front windows. There also has a Dometic wind out awning for alfresco dining or relaxing.